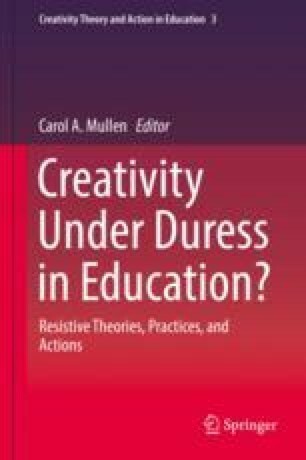 Creativity Under Duress in Education? This chapter explores the impact of politics on creativity. It begins by distinguishing creative potential from creative achievement. Creative potential is the ideal target for the educational system. The problem is that, although there are reliable indicators and predictors of creative potential, there is always uncertainty with a prediction. Political decisions often concern how to invest resources, and predictions may be seen as risky investments. Education for creative potential requires tolerance (e.g., risk tolerance, tolerance of ambiguity) and a long-term perspective. In addition, creative potential may take some time to mature to the point that it leads to creative action, but political decisions are often focused on short-run outcomes. Yet it is the investment in potential that will eventually lead to the greatest impact on the largest number of students, and then on society. Also explored in this chapter is the important role of tolerance, which is related to creativity in various ways but is anathema in the current political climate of the USA. Under discussion is how conservative thinking is typically contrary to creativity and how creativity benefits from various kinds of openness. “Spin” and the reliance on alternative facts, so common in politics, are symptomatic of the dark side of creativity. Educational implications are noted throughout.